Integrate the One-Click-Recruiter into your existing processes and start to benefit from all the diverse and useful advantages today. The technology of the One-Click-Recruiter is 100% modular and it can be quickly and easily integrated into your existing recruiting processes and software structures. You can quite normally continue to work with your current application management system while also taking full full advantage of the One-Click-Recruiter. Our technology is already used by software companies as an extension of their product portfolio. Furthermore, media agencies, publishing houses, and even job boards use the technology to automate internal and external processes. You are already working with a candidate management system and do not want yet to miss the advantages of the One-Click-Recruiter? Double maintenance is too stressful to you? Time is money or a scarce commodity? No problem at all. We dock the one click recruiter to your existing system and save valuable time which otherwise would be lost in administrative processes. From now you decide yourself for each posting, whether the first point of contact should be your candidate management system form or not. Complicated application procedures discourage the one or the other talent and you might lose valuable resources. Perform A/B tests in difficult-to-be filled positions and find out which contact point is closest to the job position fits. Always remember that in our time the next employer is just in a "one-click-distance” seen from the perspective of your potential candidate. Yet it couldn't be easier! We do everything we can to enhance your personal comfort and minimize your daily work load. With our technology, we provide a friction-free importation of ads directly from your career site into the one-click recruiter. To start as soon as possible, please contact our service. software company – no problem. 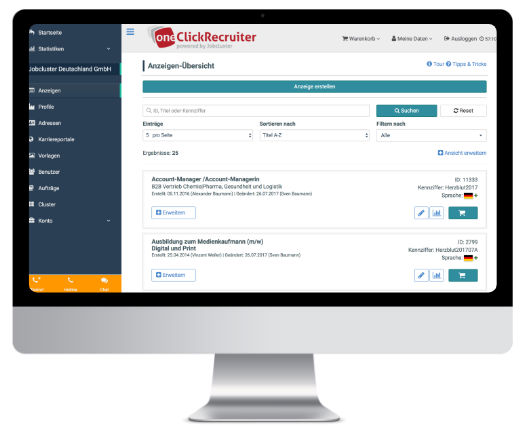 Gradually incorporate the one click recruiter in your existing processes, to allow customers or your employees to manage job ads easy and to distribute them targeted with one click. As a software company we make your software to a turnkey and fully customisable Recruiting module, that your customers can use immediately as an added value. Extensive import and export functions and individually tailored interfaces as well as intelligent authentification processes guarantee a clean and safe exchange of customer and ad data also data about clicks and applicant statistics. The one-click recruiter can be docked and imbedded with just a few hand movements. In an increasingly tougher market environment, we rely more and more on strong partnerships, allowing free scope for action on both sides by individual models of cooperation. Successful projects help to equip you quickly with all necessary documents, procedures and processes to get familiarized. Use us as your reliable partner and build a strong brand. we offer you a fully functional all-in-one Recruitingsoftware with strong distribution focus which is available overnight as a white label solution. Customers and ads will be managed by yourself furthermore you benefit from our many years of expertise and dealing as a strong buying group. With our tool, we put you in the position to remain competitive and stay groundbreaking for the future. Remain independent and present your brand through a corresponding white-label solution. Due to a web-based system no installation is necessary, therefore you can start after depositing your quota agreements, or through entry into our shopping community directly. Our service will quickly set up your employees in all practices and processes. Start with an agency account today! we offer you also to operate cross-media. We work hand in hand with your team. The One-Click-Recruiter helps you quickly and professionally to convert display print ads into a HTML and to provide them into your own jobboard and optional into the Jobcluster World. Don't hesitate to contact us today for further information! Explore more benfits of the One-Click-Recruiter.